U.S. military advisers had been in South Vietnam a decade, and their numbers had increased as the military position of the Saigon government became weaker. After the attacks on U.S. destroyers in the Tonkin Gulf, President Lyndon Johnson asked for a resolution expressing U.S. determination to support freedom and protect peace in Southeast Asia. Congress responded with the Tonkin Gulf Resolution, expressing support for "all necessary measures" the president might take to repel armed attacks against U.S. forces and prevent further aggression. 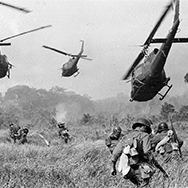 After this resolution, and following a Communist attack on a U.S. installation in central Vietnam, the United States escalated its participation in the war to a peak of 543,000 in April 1969.